This is a weird book. I mean, obviously. But I mean, I'm a big fan of R.L. Stine, king of the slightly cheesy horror books for kids. And I found this book too cheesy. 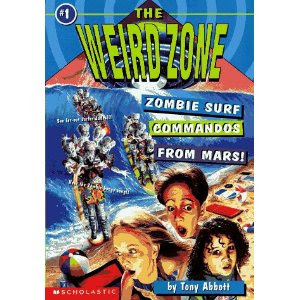 Liz, Holly, and Jeff are hanging out at the beach, when suddenly, zombie surf commandos from Mars come surfing out of the lake onto the beach, and start looking for brains! They're both zombies and from Mars because they were normal Martians, and were made zombie-like by something about Earth. Anywho, the kids have to come up with a clever plan to get the zombie surf commandos to go back to Mars. What else can I say? It was just really weird, and really cheesy. 2 stars. That's what I gave it in the heat of the moment. I can no longer remember why it got 2 stars instead of 1. I must have liked something. The title is any indication, two stars is more than fair. Haha! Yeah, this one was pure cheese. Which was not at all surprising.